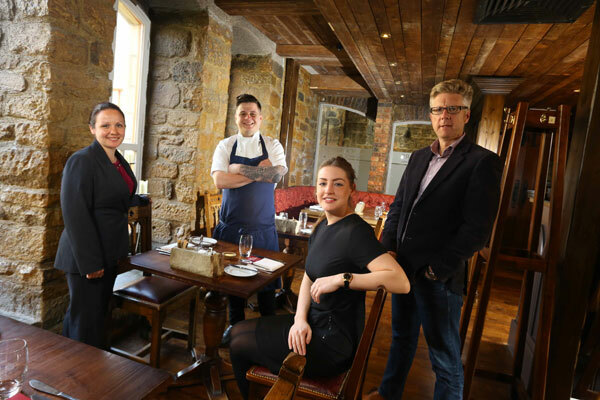 An exciting phase in Blackfriars’ history is being unveiled, as a local restaurateur brings back to life disused buildings within a 13th century Newcastle medieval friary. Andy Hook, who has been at the helm of Blackfriars Restaurant, Banquet Hall and Workshop for 16 years, has completed an ambitious scheme to renovate several empty areas of the historic venue – including the friary’s Parlour and library rooms. He has commissioned local craftsmen to painstakingly refurbish the dining room, which served as the friary’s refectory. The Parlour was originally the heated waiting room for visitors to the friary. For many years it was a gift shop, but has now been re-instated to its former glory, creating a unique setting where guests can enjoy a drink before or after their meal. Bar drinks and snacks will also be served throughout the day. The rooms above the restaurant, formerly the libraries for the Dominican Friars and meeting rooms for the city’s Crafts Guilds, now house a larger 14-seat Cookery Workshop, enable the team to expand the number of workshops, which now average around 250 per year, including Bread Making, Dinner Party cooking and Kids’ cookery classes. Above the restaurant’s dining room, the team has opened the former Tanners’ Meeting House as a Tasting Room, featuring antique 19th century seating, which will now cater for a range of events including wine, beer and whisky tasting for up to 40 people. Toilets have been relocated to the first floor to make way for more seats and greater comfort. Blackfriars’ Banquet Hall, which hosts more than 300 events per year, now features a new toilet block in the former Prior’s Quarter, including disabled facilities. This area of the building has seen its fair share of royalty, including King Edward III who met Edward Balliol, the claimant to the Scottish throne, inside the hall in 1334. The main restaurant has undergone extensive refurbishment, increasing seating capacity to 90 people with additional booth seating. This dining space has become one of the region’s leading restaurants under Andy’s leadership, winning ‘Taste of England’ in the North East England Tourism Awards.